The annual conference has taken place in recent years at Washington's Ritz-Carlton hotel but is scheduled this May for the Trump International Hotel. This spring, the Trump International Hotel in Washington, D.C., will host a three-day event co-hosted by a business group. That's not unusual. But here's what is: The group's chair founded the company that paid President Trump's former national security adviser, Michael Flynn, for lobbying work that may have benefited the Turkish government. What: The 36th Annual Conference on U.S.-Turkey Relations is scheduled for May 21-23. Where: At the Trump hotel, just blocks from the White House. It had been held in recent years at the Ritz-Carlton hotel in Washington. Who: The Turkey-U.S. Business Council, known as TAIK, and the American Turkish Council are the sponsors. The former group is chaired by a Turkish-American businessman, Ekim Alptekin, who has ties to the Turkish government. More about who: Alptekin also is the founder of Inovo BV, a company that paid Flynn's consulting firm, Flynn Intel Group, $530,000 for lobbying work that may have benefited the Turkish government. Ruya Eichelberger, a spokeswoman for the American Turkish Council, says the dates when the organization wanted to hold the conference this year weren't open at the Ritz-Carlton. The group did its first walk-through at the Trump hotel in 2015, she says, while it was under construction, and booked it in October 2016. The previous annual conference took place at the Ritz-Carlton from Oct. 30 to Nov. 1, 2016. But ethics experts have concerns about special interest groups, lobbyists and foreign governments bringing their business to Trump, who has a dual role as president and innkeeper. These critics point to the U.S. Constitution's Emoluments Clause, which prohibits presidents from accepting benefits from foreign powers. Despite such concerns, Trump has not divested from the five-star hotel bearing his name and in fact has dropped in for dinner and to mingle with patrons. The website for the Turkish conference says "hundreds of stakeholders" are expected to convene at the hotel "to address key bilateral commercial and diplomatic topics." Business leaders, entrepreneurs, investors, members of the U.S. Congress and the Turkish Parliament are also expected to attend. In the view of those concerned about the Emoluments Clause, it doesn't matter when the event sponsors made plans to move to the Trump hotel; the decision to go forward with it now is inappropriate because of Trump's role as president. 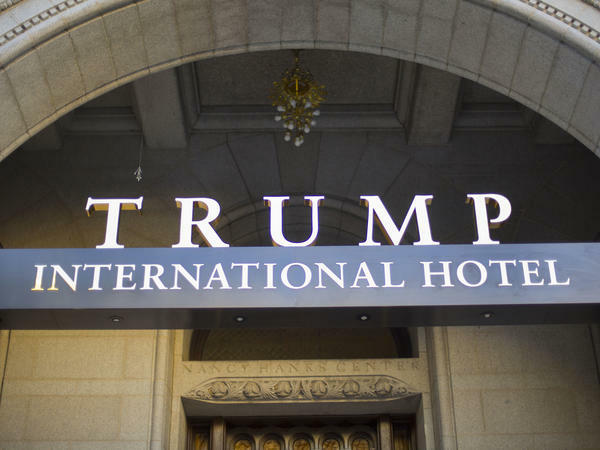 Kathleen Clark, a law professor at Washington University in St. Louis and a leading independent scholar on government ethics, said that by choosing a Trump hotel, the sponsors of the event "may be trying to amplify its voice, increase its influence, and purchase access to the Trump administration by enriching President Trump and his family." The issue was raised last month, when Kuwait moved its national day celebration to the Trump hotel. At the time, Norman Eisen, who had served as President Barack Obama's ethics czar, told NPR that the Founding Fathers wrote the clause "because they were so worried about swag, any kind of swag, coming to an American president just for the reasons ... that it would distort presidential decision-making to benefit himself."